From off the shelf standard pricing applications to bespoke integrated systems, our IT solutions are designed with the ultimate user in mind. IT projects have perhaps the highest failure rate, but the number of failed IT projects in the insurance and reinsurance industry is higher than in any other industry. On the business side we have management, underwriters and actuaries who are supposed to provide the specification and scope of the project from user interface to formulae to process data to ultimately generate an answer. Specifications after often vague at the start and end up changing several times during the development phase, increasing costs and delaying the project. From the development side, we have IT programmers and database architects who know the ins and outs of programming and the latest technology, but do not know insurance and its terminology. They need specifications that they can easily understand and translate to a programming language. In between we have project managers and business analysist who are supposed to act as interpreters between the business and the programmers; however, they often do not have insurance or programming experience. The result: a system that does not meet client’s requirements, is unlikely going to be used by and hundreds of thousands of dollars or pounds wasted. Here at MatBlas we have a unique combination of skills: our actuaries are good programmers, have worked in insurance and reinsurance companies and understand and speak the same language and terminology than our clients. Our software developers understand insurance, understand the terminology and understand actuarial methods from pricing, reserving, reinsurance and capital modelling. All our software developers have taken our actuarial courses for non-actuaries. Before we start a project we analyse current workflows, systems, existing technology and databases used by our clients and we spend time understanding our client’s vision and expectations for the project. We then translate this into a system and choose the best platform and technology available to meet the client’s requirements. From off the shelf standard pricing applications to bespoke integrated systems, our IT solutions are designed with the ultimate user in mind to ensure ease of use and understanding. Contact us to discuss your systems and software requirements and to see a demo of some solutions we have developed for London Market clients. Thorough actuarial testing of each component before assembling the system so any error are easily corrected instead of being disguised in a big system. User manuals and guides throughout the system to facilitate use and for new users in the future. Algorithms usually written by actuaries and implemented by programmers making it easier for programmers to understand what is expected. Significant user testing before it is send to the client for testing. SMART Re™ brings you the solid methodology you are used to in a cutting edge platform with integrated management information reporting tools. Every treaty pricing actuary and underwriter dreams of a pricing tool in a single file, with integrated workflow from data to combined ratio with a data warehouse that captures all claims, premiums, exposures, benchmarks and each and every selection used throughout the rating process. It is sad to see highly skilled actuaries who should be spending their time using data to enhance their company’s benchmarks and data analytics spending weeks compiling, cleansing and formatting data that have been stored in countless spreadsheets. So why so few reinsurance actuaries actually achieve this ideal workflow? Because many opt to develop models in Microsoft Excel and in spite of model being revamp and re-done from scratch every couple of years, the objective is hardly ever achieved. They opt for comfort and familiarity instead of embracing change. Are you ready to once and for all move away from Excel spreadsheets and embrace what technology has to offer? Are you committed to bring efficiency and cost savings to your company? Are you committed to create a robust database that captures all the data you require for benchmarking and portfolio analysis so that you can spend time analysing data instead of formatting and cleansing it? If your answer is Yes, then Smart Re™ is the solution you have been looking for. SMART Re™ is not a ground breaking new mathematical way to price treaties. SMART Re™ is not about the maths, is about the platform. SMART Re™ brings you the solid methodology you are used to in a cutting edge platform with integrated management information reporting tools. SMART Re™ is designed to save time that you can invest doing more in-depth analyses and interesting projects. 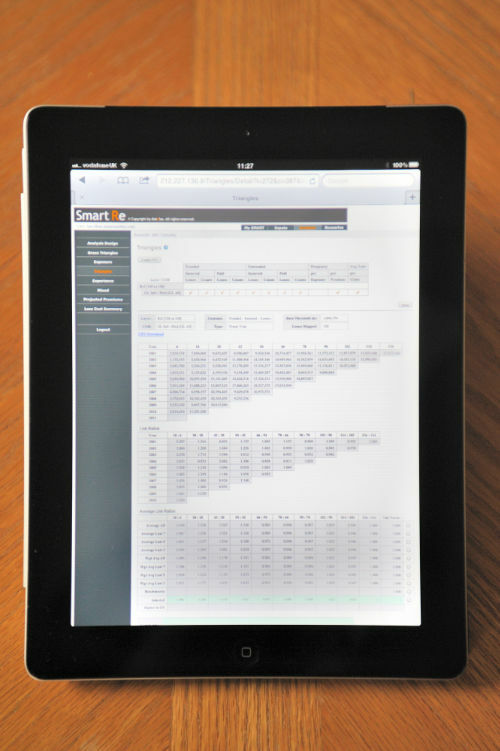 The brochure will give an idea of what Smart Re™ and the look and feel of the user interface. If you think are ready to try it out we offer a 90 minute live demo and a 3-month no obligation free trial for everyone in your team to have the chance to test the system before making any commitments. Smart Re™ is not for everyone and it may not be the right system for you. So if you are interested in finding out more, first get in touch to discuss whether Smart Re™ is right for you and your team. Core benefits – why SMART Re™? No software and no dongles to install, so it’s ready to be used from any device immediately. Use in as many devices as required, even your iPad®. Easy to follow intuitive workflow. Single record even for the most complex multi-line accounts; from data all the way to the economic summary of the programme all is in one record. No pre-determined method, all standard methods are available and users can choose their prefer approach. Mobility, use it anywhere any time. Live updates with new features without affecting records created in older versions. Free technical and actuarial training for beginners. Easy to renew and compare year on year pricing assumptions and results. Can be tailored to meet specific requirements not already in the system. Can be hosted in internal servers if client prefers. FREE no obligation 3-month trial licence.